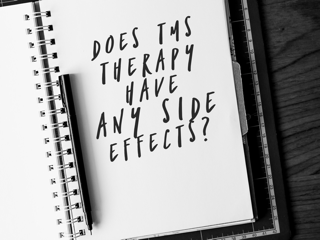 What are the side effects of TMS treatment? Even though TMS treatment is considered to be very tolerable to our patients, there are a few possible side effects of TMS treatment, that you should know about before starting your TMS journey. The most common side effects experienced are considered to be relatively mild. Side effects are more likely to occur during the first few treatment sessions. Side effects of TMS treatment may include mild headaches, light-headedness and mild scalp irritation. While the most serious side effect associated with TMS therapy is a seizure (or fit). Although the risk of a seizure is extremely low at approximately 0.1% per treatment course, our clinicians take the risk very seriously and will discuss this with you during your initial consultation. Mild headaches are more likely to occur during and after the initial treatment sessions. You can usually treat this by taking mild paracetamol such as Panadol. Light-headedness or feeling faint is more common in anxious and younger patients. Patients who have similar experiences such as visiting the dentist may also feel uneasy. Some ways to not feel faint is to bring along a family member or friend for you to talk to during treatment. You can also listen to music or watch television. Mild scalp pain has occurred in some patients during or after treatment. It can usually be minimised through mild painkillers such as Panadol. If you do experience this side effect, it usually subsides as your treatment progresses. A change in energy just means that you can experience an elevated energy level and may have difficulty in sleeping after your TMS session. Your doctor can help you with this so you can happily continue to undergo treatment. Seizures (fits) are a highly unlikely side effect to occur because the TMS treatment is always measured and monitored correctly to ensure the risk of seizures is minimised.